Trees that had only recently been placed by a local community group and primary school were destroyed in a gorse fire which took place last week. Their actions, a local councillor has said, will not stop work to improve the local community from improving the area. 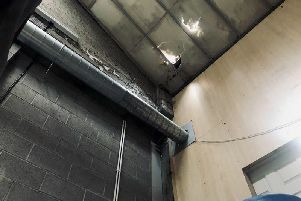 Describing the culprits as ‘idiots’ SDLP Torrent Councillor Malachy Quinn condemned what he said was a second moss fire in Derrytresk which took place on Easter Sunday night. Speaking about the incident Cllr Quinn said: “For the second time in as many weeks I find myself having to condemn a moss fire in Derrytresk. “What makes this fire all the more frustrating is that over the last few weeks the local community group along with pupils from Kingsisland PS have been working hard to plant new trees in the area, to help develop it for future projects. “Sadly some of these trees have now been destroyed by this fire. “There is no question that this fire was deliberate and those who done it have no regard for the hard work being down by the community, the football club or the school. Cllr Quinn continued; “Those responsible for this fire need to grow up and start thinking about other people in the area instead of just themselves.